The Mint Act of 1792 mandated a $10,000 personal bond for both the Chief Coiner and Assayer before any gold or silver coins could be minted. Henry Voigt and Albion Cox were appointed to these positions respectively, but being men of modest wealth, neither could post bond. It wasn’t until after Congress relaxed the amount in 1794 to $5000 and $1000, that Voigt and Cox complied. This delay explains why only copper coins were produced at the Mint until 1794. Production of the $5 dollar gold coin, officially termed half eagles, began on July 31, 1795. That day, 744 half eagles were struck, the first gold coins ever minted by the United States. The obverse, seen directly below, depicted Liberty facing right, wearing a turban female cap popular in that era. The reverse showed a scrawny eagle perched on an olive branding while holding a wreath high in its beak. The weakling eagle evoked criticisms far and wide. The Mint was concerned about the U.S. image conveyed to the world through its coinage, and so in 1798 adopted a larger, or “heraldic”, eagle bearing the Great Seal of the United States. The five dollar gold coin carrying the stronger bird was minted every year until 1807, with the exception of 1801. The early Mint was plagued by scarce resources and continued to use workable dies regardless of their date. Thus, there are large eagle reverses dated 1795 and 1797. A few 1798 half eagles with small eagle exist and are incredibly rare. 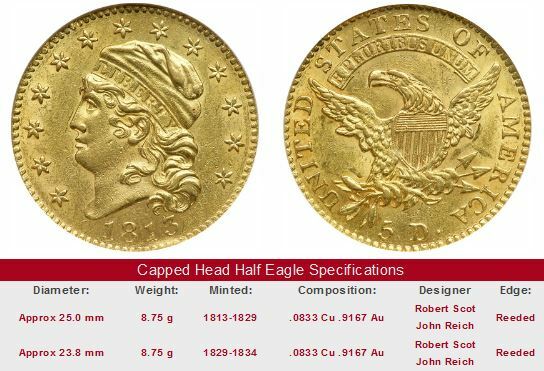 Numismatists have named the leadoff half eagle type the Capped Bust, Small Eagle type, and it is pictured above. Its immediate successor is called the Capped Bust, Heraldic Eagle type. Many collectors also refer to them as Turban Head Half Eagles. In 1801, Mint Director Elias Boudinot hired John Reich, a talented German die engraver who attached himself as an indentured servant in exchange for passage to the United States. Political sensitivities inside the Mint prevented Reich from fully practicing his trade until 1807, when he was promoted to Assistant Engraver. Reich was immediately handed the task of improving coinage designs. One of Reich’s accomplishments included a new half eagle design. The Capped Bust to Left, sometimes known as the Capped Draped type, first appeared in 1807 and depicted Miss Liberty facing left, surrounded by six stars to the right and seven to the left. She wears a mobcap inscribed with LIBERTY and has curly hair cascading down to her shoulders. Newspapers of the day ridiculed the Reich design as too European. The reverse motif shows an eagle with outstretched wings, sitting on an olive branch and grasping three arrows in its talons. The lettering “5 D.” was worked into the design, the first time a face value indication appeared on a U.S. coin other than coppers. The same Capped Draped design was adopted for the quarter eagle in 1808. Reich’s eagle reverse remained on U.S. coinage for exactly 100 years. In 1813, Reich modified the half eagle to show Liberty’s enlarged head from the neck upward, and repositioned the stars, resulting in what today we call the Capped Head type. Reich resigned in 1817 over disillusionment with his inability to secure a promotion or pay raise during his 10 years with the Mint. Many historians believe the territorial Chief Engraver, Robert Scot, had a hand in undermining Reich’s career advancement. Starting in 1829 the diameter of the Capped Head Half Eagle was reduced from 25 mm to 23.8 mm. Liberty was retooled to appear higher in relief. An obvious difference was disappearance of the denticles in favor of a beaded border. Smaller lettering, dates, and stars also characterized the half eagle facelift. 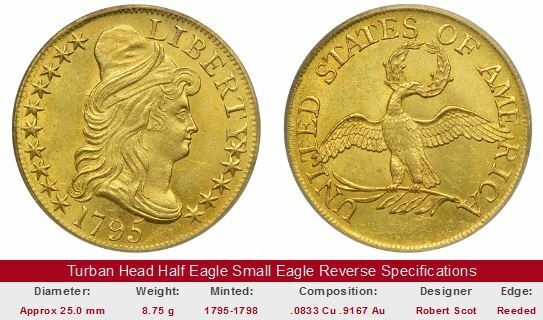 The final year for the Capped Head Half eagle was 1834. The USS Constitution was first launched in 1797. She was returned to service on her 200th birthday, July 21, 1997, and is the oldest commissioned ship afloat in the world. The Constitution is the most famous ship in the history of the US Navy. Her heavy construction and superior speed won important victories at sea for the young United States, seeing action in the pseudo-war against France and against the Barbary pirates. The ship earned the name "Old Ironsides" after obliterating several British vessels during the War of 1812. 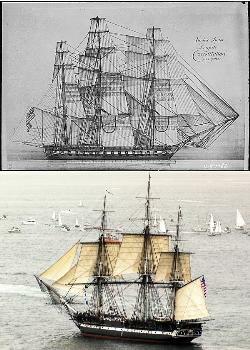 The drawing on top shows Constitution when she was new. The bottom photo was taken July 21, 1997, the day she was re-commissioned. After 116 years of relative dormancy, the Constitution set sail once again. The modern day mission of "Old Ironsides" is that of "ship of state", participating in ceremonial events and educational programs. It is manned by active duty Navy sailors. The half eagle types of 1795-1834 are collectively known as Early Half Eagles. Their combined mintage is only 2.12 million to begin with, but it is their extremely low survivorship rate that has left numismatists with a very limited supply to choose from today. Huge numbers of the oldest U.S. gold coins were melted and this is what caused the scarcity of early five dollar gold. Why were so many gold coins destroyed? The aforementioned Mint Act of 1792 set a rigid bimetallic value standard of silver to gold at 15 to 1 in the United States. Large discoveries of silver in Latin America, combined with wars on both sides of the Atlantic drove the free market ratio in Europe to more than 16 to 1. Under these conditions, the intrinsic metal value of all U.S. gold coins exceeded their face value, if sold in Europe. Speculators in the U.S. would buy one ounce of gold (in the form of coinage) for 15 ounces of silver, ship the gold to melting pots in Paris or London, and receive 16 ounces of silver in return, which was then sent back to the U.S. This cycle repeated itself until there were virtually no gold coins circulating in the U.S. In an 1831 Paris incident, about 40,000 half eagles perished in one day. In response to the actions of the metals speculators, Mint officials suspended production of all U.S. gold coinage, with the exception of the half eagle. Banks settled on half eagles as their choice for maintaining reserves and making international payments, so there was some demand for the coin. Eventually, most of the half eagles originally distributed to banks met the same fiery fate as other five dollar gold pieces. Only after Congress reduced the gold content of U.S. coinage in 1834 did the bullion profiteering cease. The new law also stimulated gold mining in the south, leading to branch mints in Dahlonega, GA, and Charlotte, NC in 1838. All Early Half Eagles are quite rare. Any genuine half eagle example dated 1795-1834 is considered by collectors as a highly desirable acquisition. 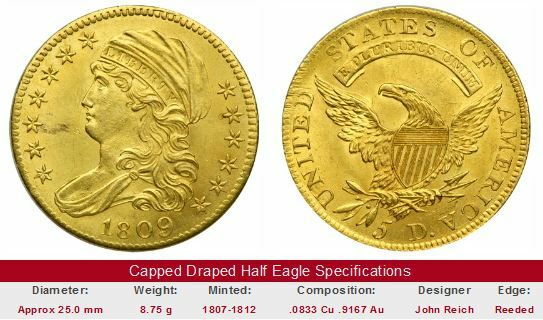 Several of the most legendary coins in all of American numismatics call Early Half Eagles home. Among them is the 1798 with small eagle. Only seven of these are known to exist and seldom come up for sale. An XF-40 specimen was sold in 2000 for 264,500. Another is the 1815. About a dozen of these are confirmed, with the finest one having a value of $500,000 minimum. Of the 17,796 reported half eagle mintage in 1822, only three examples are located today, two of which reside in the Smithsonian Institute. The 1829, both large and small date varieties are highly elusive, as is the 1832 with 12 stars. Next, there is a subset of Early Half Eagles that are very scarce, but do not command six figure sums to purchase. Collectors with very strong financial resources should consider these as some of the finest coins in American numismatics, if future value appreciation is an important consideration. Examples are the 1795 Small Eagle, 1797/5 Large Eagle, and the 1821. It is strongly recommended that you only buy Early Half Eagle gold coins that have been certified by one of the four leading grading service companies: PCGS, NGC, ICG, or ANACS. Early Half Eagles are rare and valuable coins. Overgrading by even one or two points on the 70 point grading scale costs you thousands. 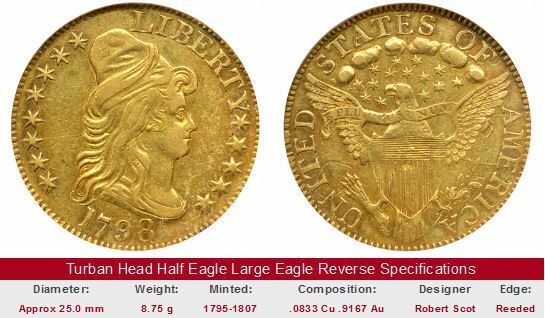 The links below take you to eBay US coin auctions that are offering Early Half Eagles. The link on the right hand side of the first box is coded to bring up all auctions for Turban Head $5 gold with small eagle. The 1795 value trends are shown on the left hand side to represent the type. The second box represents the Turban Head type with large eagle reverse, calling upon the 1800 half eagle to typify value trends. The third box highlights the 1808 half eagle, corresponding to the Capped Draped type. Lastly, the Capped Head is shown, exemplified by the 1823. These selected dates are quite rare indeed, but they are actually the most readily available of their type, if you can call it that. There is a huge number of coins for sale on eBay, but there are not many genuine Early Half Eagles. Good luck on finding one for sale, but from time to time, one does come up, usually inviting a lot of competition from serious collectors. If you decide you're ready to acquire an Early Half Eagle, be sure to heed the advice regarding third party grading.